Lock in a great price for Silky Oaks Lodge – rated 9.6 by recent guests! The quiet surrounding the property, allowed for one to get away from it all. The staff were courteous and attentive. The service is fantastic,the staff and management are super friendly and the cottages are very private and well designed to enjoy the beautiful rainforest and river. We loved it so much that we came back and stayed four more nights. We left feeling 100% rejuvenated. One of the best experiences I ever had...when you swim in their pool surrounded by the rainforest, you'll know what I mean! The setting can't be beaten. The river is beautiful and being able to swim in it is great. The front desk staff are very friendly and helpful. Our treehouse was very quiet and private. I loved this place! Beautiful setting, phenomenal service. One of the absolute highlights of our whole Australia trip! This is such a special place tucked away in the rainforest. The staff was extremely kind and accommodating. The room was beautiful - we arrived to candles, music and complimentary bottle of wine. The turn down service in the evening was also a lovely added touch. Stunning!! what a gem of a place. The breakfast was the best ever. The atmosphere of the forest will stay in my mind. Thank you for a wonderful yoga session. Silky Oaks Lodge This rating is a reflection of how the property compares to the industry standard when it comes to price, facilities and services available. It's based on a self-evaluation by the property. Use this rating to help choose your stay! In the tropical Daintree Rainforest, the Silky Oaks Lodge features balcony rooms with hammocks and forest views. It has an outdoor pool, a tennis court, and first-rate spa facilities. All guest rooms are air-conditioned and include a CD player, minibar, and a private spa tub. Spa facilities at Silky Oaks include face and body therapies, sodashi massage, and foot rituals. Guests can also experience a purifying mud bath or a special scalp treatment. The open-air Treehouse Restaurant offers forest and river views, and serves breakfast, lunch and dinner. Private riverside dining is also available. The Silky Oaks has several activities, including snorkeling, canoeing on the Mossman River, and guided walks through the rainforest. The Silky Oaks Lodge is a 20-minute drive from Port Douglas. Free on-site parking is available. This property also has one of the top-rated locations in Mossman! Guests are happier about it compared to other properties in the area. When would you like to stay at Silky Oaks Lodge? Set in prime riverfront locations, the River Treehouses have spectacular rainforest views and you can listen to the soothing sounds of the Mossman River directly in front of you. There is a hammock on the balcony inviting you to slide open the tall glass doors to breathe in the perfume of the rainforest. A day bed, an arm chair and foot rest provide other options for relaxing. Make yourself a cup of tea and savor the selection of home made biscuits. 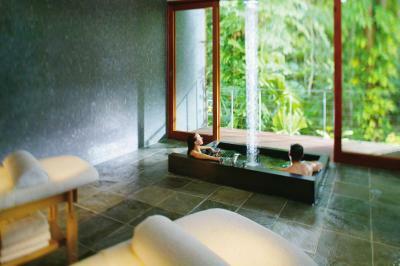 Relax in your own spa bath with uninterrupted views of the rainforest. 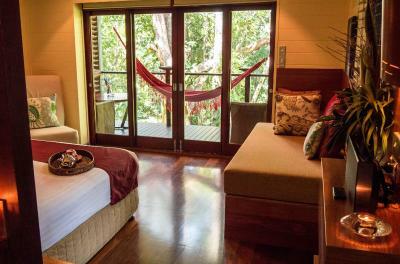 This Deluxe Treehouse accommodations has a beautiful private setting within the rainforest and tropical gardens. Immerse yourself in the sounds of the forest from your balcony with a double hammock. A cozy and luxurious ambiance awaits you in your private Daintree Treehouse. Unwind on your outdoor veranda and take in the sites and sounds of nature while enjoying afternoon tea or a refreshing cool drink. Lay in your hammock and relax to the rhythm of the tropics. The Treehouse King room overlooks the tropical gardens and is close to the main lodge the Garden Treehouses. These rooms boast Rosewood and Silky Oak timber throughout. Floor to ceiling windows open out to your own veranda with hammock. 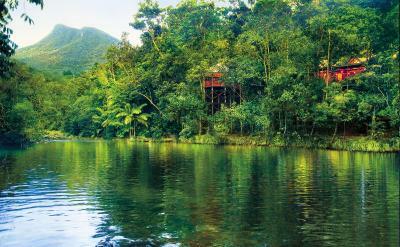 Set overlooking the Mossman River, immerse yourself in the sounds of the rainforest and river. Enjoy afternoon tea or dinner on your double veranda and let nature take over. Relax in style in your own private lounge after a day out exploring the Daintree National Park or the Great Barrier Reef. This suite has a balcony, seating area and CD player. House Rules Silky Oaks Lodge takes special requests – add in the next step! Children 12 and older are allowed at this lodge. Silky Oaks Lodge accepts these cards and reserves the right to temporarily hold an amount prior to arrival. Please note that a 1.25% surcharge applies for payments with credit card. Please inform Silky Oaks Lodge of your expected arrival time in advance. You can use the Special Requests box when booking, or contact the property directly using the contact details in your confirmation. Next time we will visit in the dry season. We couldn't enjoy the walks because of the incessant rain. OK - it is a rain forest area!! Also the mossies. The wine was far too expensive and very little available by the glass. That was the only negative thing I can think of. One pancake...seriously? A ridiculously expensive wine list. Attentive staff with no fuss. The self guided driving tour to Cape Tribulation was excellent. Reception team very friendly, excellent good breakfast. Perfect location in the middle of the rainforest, though near Mossman and Port Douglas as well. Bed was really comfortable, food and drinks fantastic, setting and ammenities stunning. Staff were helpful and friendly. Food portions could be larger for the price. The environment. Jarrod the bartender! We had a Riverview hut which had superior views to the Tree huts. Sensationell resort, awesome people, amazing venue, very comfy treehouse. A must-go when you want to stay in the Daintree. Drinks in the Jungle room and a lovely meal overlooking the river.